In the early 1980s, the modifications group installed two high-density storage racks side by side in the spent fuel pool at the Browns Ferry Nuclear Plant in Alabama before an upcoming refueling outage. The original low-density racks were first removed from the pool to make room. Due to time constraints, post-installation testing could only be completed on one rack. Therefore, the rack that was successfully tested could be used to store fuel while the untested rack could not be used until it was tested during the next refueling outage. Because one rack had plenty of storage spaces to hold the irradiated fuel assemblies scheduled for offloading during that outage, there was no urgent need to test the second rack and make it available for use. Figures 1 and 2 illustrate the spent fuel pool re-racking concept. In both cases, there are three rows of racks within the pool, with four racks in the top row and five racks in each of the bottom rows. Storage locations for fuel assemblies within the racks are represented by plus signs (+). 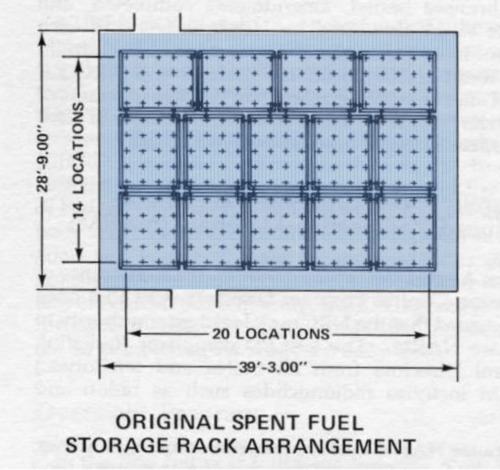 The original racks could store up to 280 fuel assemblies (14 rows by 20 columns). The replacement racks could store up to 651 fuel assemblies (21 rows by 31 columns). Capacity more than doubled in this re-racking example. The original racks maintained a subcritical configuration (i.e., prevented the nuclear fuel from achieving and sustaining a nuclear chain reaction) through physical separation. The fuel assemblies were stored too far apart to create a critical mass. In the replacement racks fuel assemblies were packed so closely together that a nuclear chain reaction could occur, except for the fact that boron was sandwiched between the thin metal walls of each storage location. Part of the testing required for the replacement racks was a “blackness” test to verify that the boron prevented neutrons released from a fuel assembly from reaching fuel assemblies in adjacent storage locations. During the refueling outage, more than one hundred irradiated fuel assemblies had been offloaded from the reactor core into a spent-fuel pool rack when an engineer from the modifications group glanced down into the pool and asked why the untested rack was being used. The operators and reactor engineers were stunned—they thought they had been filling the tested rack. Instead, they had offloaded over one hundred irradiated fuel assemblies into a rack that had not been verified to prevent criticality. 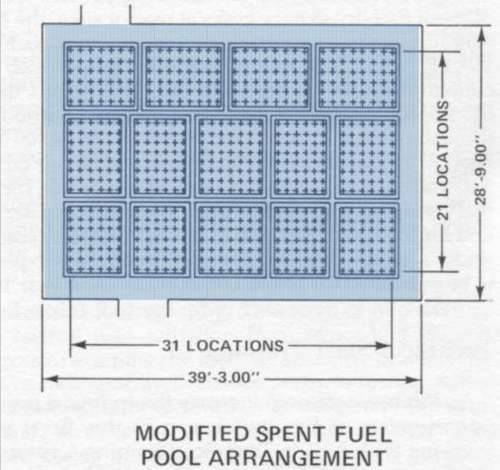 Investigation revealed that the modifications group used a spent-fuel pool map that looked upward from below the pool while the reactor engineering group used a pool map that looked downward from above the pool. Consequently, these two groups considered the tested and untested racks to be exactly opposite from one another. The fuel assemblies were relocated from the untested rack to the tested rack and refueling activities resumed. The glitch cost more than a day’s delay in the core reloading schedule. When tested, the storage locations in the “untested” rack all passed the “blackness” test and were approved for use. Had problems existed, the unauthorized loading of more than 100 fuel assemblies into the rack could have resulted in a critical configuration. A criticality in the spent fuel pool could have exposed workers within line of sight, such as those on the refueling platform above the pool, to excessive radiation exposures. It also would have been challenging to stop, as the Browns Ferry spent fuel pool is equipped with neither control rods to insert or borated water to readily inject to interrupt the nuclear chain reaction. Everyone had a map, but none of the maps had legends. It was left up to the viewer which end was north and which was south. Each viewer saw things from his or her own perspective, rendering the many maps virtually useless. Situations like this one that are so clearly visible in the rear-view mirror can be challenging to spot out the front windshield. The cost of making labels unambiguous (e.g., north and south instead of top and bottom, etc.) can be cheaper than the price of correcting mis-communications.